Here's a look at 3 monochromatic color schemes: green, red, blue. A monochromatic color scheme uses variations in lightness and saturation of one color for most of the elements on your scrapbook page. Neutrals are often combined with the monochromatic colors. A scrapbook page with a monochromatic color scheme looks clean and elegant — and it’s easy to choose your products and know they’ll go together when you narrow down your choices to one color and its various shades and levels of saturation. 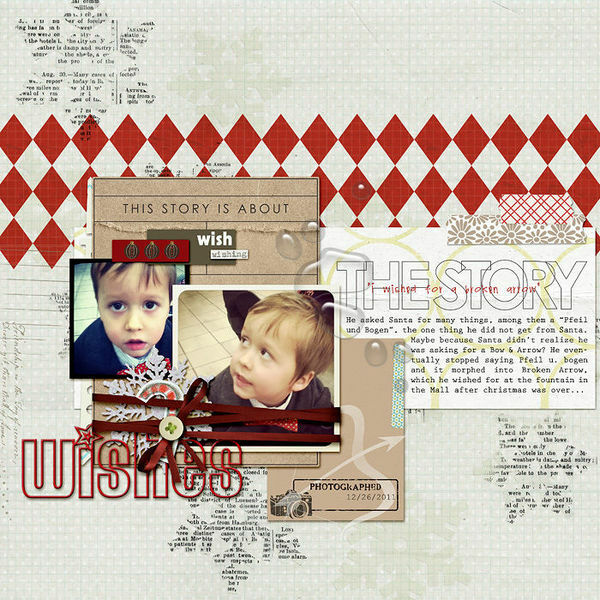 Ideas for making the most of monochromatic color schemes on scrapbook pages follow. Pumpkin Patch Kids by Amy Kingsford | Supplies: Sweater Weather Kit by One Little Bird Designs, Drop Shadow Actions by One Little Bird Designs, Epic Collaboration by Paislee Press, One Little Bird Designs and Biograffiti, Stitched Tan No. 1 by Anna Aspnes, Paper Bag Alpha by Lynn Grieveson, Sketch #79a by Debbie Hodge,CK Summer font. I took the bits of color in my photos — red — and used them on this red-and-gray monochromatically-schemed page for a clean and elegant look befitting any evening.